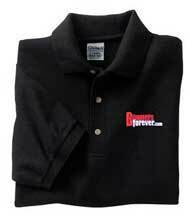 Quality black "Gildan" golf shirts with embroidered Boomersforever design on front left side. Black shirt with red and white text. Comes in sizes medium, large and extra large.